The Viticulture second edition box has a red stamp on the upper right that indicates the inclusion of grande workers. There are some updates to the first edition of Viticulture that will become standard in the second edition. These updates can be seen along with an overall summary of the game on this one-page printout created by supporter Nersi Nikakhtar. The most current version of the game is the Essential Edition–it is bigger and better in every way than the second edition, for the same price. It may be placed on an already full action to perform that action. For example, if you are playing a 2-player game and the other player chooses to give a tour with regular worker to gain 2 lira. If you really needed to give a tour, you may then place the grande worker on that action (on the art for that action, not an action space) to gain 2 lira as well. Multiple players may place their grande workers in this way. Otherwise you may place your grande worker on any action as you would place a regular worker there. Viticulture is a very tight game–that was our intention when we designed it. It adds plenty of tension to the game. The problem is, there are times when that tension crosses the line into frustration when a player was really counting on getting a certain action but they couldn’t get it due to something out of their control (like turn order). The result is that selecting one of the first slots on the wake-up track becomes much less of a choice and more of a necessity. Also, the end of the game can be quite anticlimactic. Once the wine order and winter visitor action spaces are full, there are no other ways to get points (beyond lira for the tiebreaker), which makes for a deflating end to the game, especially if you’re one step away from getting another point or filling an order. The addition of the grande worker and its new ability fixes all of those problems. The game is still very tight, but you have that one out if you really need it. And the final year of a game has many more meaningful actions. What Should I Do If I Don’t Have Grande Worker Tokens? Wait for the expansion Kickstarter campaign. Because all retail copies of Viticulture are missing the grande workers, we’re going to offer one version of the expansion pack that has the grande worker and other updated components. That way you can get exactly what you need depending on if you were an original Viticulture backer or a post-Kickstarter buyer. Use meeples from any other game. If you have lots of games with meeples, there’s a good chance there’s one sitting in the back of your closet gathering dust. Take one meeple of each color from that game and use them as your grande workers. They’ll look weird, but functionally they’re the same. Buy some big meeples. MeepleSource has “super mega meeples” that are the same size as the grande worker (24mm) and look very similar. The colors almost match up perfectly. The “crush grapes” action will henceforth be knows as “make wine.” Specifically: Make up to 2 wine tokens. If you choose the middle action space bonus, you may make an additional wine token. There are no restrictions to the type of wine you can make. You are only limited by your grapes and your cellar. Thus if you want to make one red wine and one champagne, if you have 1 white grape, 3 red grapes, a medium cellar, and a large cellar, you can make those 2 wine tokens. The old rule was really confusing. If you’ve played Viticulture a number of times now, you probably don’t find this rule confusing anymore. That’s great, and we appreciate you sticking with the game. However, we’ve found that most new players really struggle with the old rule (crush grapes into one type of wine). It’s a rule that doesn’t stick–it needs to be repeated over and over, and players often forget how it works between gaming sessions. It streamlines the game. With the old rule, making wine could be an arduous process–so much so that some players would make as little wine as possible. There was a disconnect between wine orders and crushing. Now you can have a few wine orders in hand, and you can target one of them specifically with a well-timed crush action. What About Visitors Like the Crusher or Crush Expert? For example, the Crusher says, “Crush grapes into any or all types of wine.” This card–and the other crushing visitors–retains the original meaning. Thus if a visitor card says, “Crush grapes into one type of wine,” that’s exactly what it means. Crush as many grapes as you want to make one type of wine. These visitors are now a little less powerful than before, but that’s probably a good thing. They are still quite potent, especially if you need to make a lot of wine at once or if you can combo them with another winter visitor card. Entertainer: Pay $4 to draw 3 winter visitor cards OR discard 1 wine token and 3 visitor cards to gain 3 VP. Handyman: All players may build 1 structure at a $2 discount. You gain 1 VP for each other player who does this. Horticulturist: Plant any 1 vine even if you don’t have the structure(s) required OR uproot and discard 2 vine cards to gain 3 VP. Mentor: All players may make up to 2 wine tokens. Draw 1 vine card or 1 summer visitor card for each opponent who does this. Crush Expert: Draw 1 wine order and make up to 3 wine tokens. Crusher: Make up to 4 wine tokens. Uncertified Oenologist: Lose 1 VP to upgrade your cellar to the next level. Jack of All Trades: Choose 2: Harvest 1 field, make up to 2 wine tokens, or fill 1 wine order. Vendor: Draw 1 vine card, 1 wine order, and 1 winter visitor. Each opponent draws 1 summer visitor. Novice Guide: Gain $3 and draw 1 vine card. Also, the tour guides no longer count towards the tasting room (they give you money instead of saying “give a tour to gain X,” which was confusing for some players). Replacements for these cards will be provided in the Tuscany expansion pack to those who have the original version of Viticulture, and only the revised versions will appear in the second edition of Viticulture. This is a very minor change. Instead of the starting player being the oldest player or the player with the fewest points in the previous game, the starting player will be randomized at the beginning of the game by blindly selecting one rooster. The player of that rooster’s color will be the first to select his/her wake-up time. Either of the Yoke’s abilities may be used in any season. You can harvest in the summer or winter or uproot in the summer or winter. You can still only use the Yoke once per year. 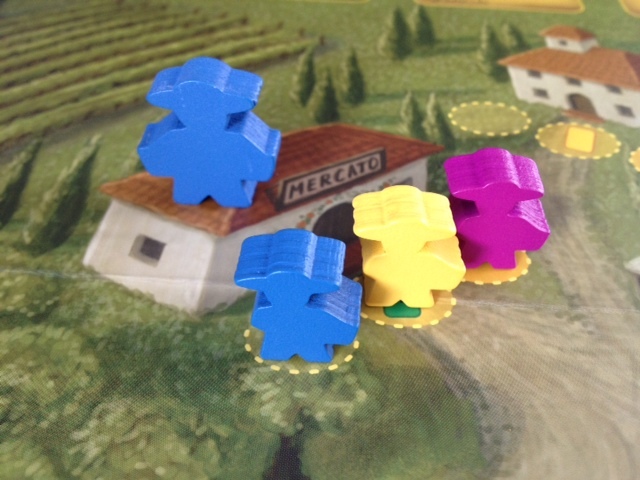 In the original Viticulture, there was a rule that said you could not choose an action space just to block someone–rather, you must be able to use the space to its full capacity (including the bonus if applicable). However, this rule is pretty clunky to explain, so we feel it’s better left to the players themselves to decide if that’s the type of players they want to be. Thus players can now place workers anywhere within the current season (within the action space limits for the number of players in the game) to use the action even if they can’t or don’t want to use the bonus. You must use the action–it’s only the bonus that is optional. It should be noted that the rule regarding playing visitor cards does not change. To play a visitor card, you must be able to complete all the things that card says you must do. If it says to harvest and fill a wine order, you must harvest and fill a wine order. We’ve heard some feedback about end-game points, but with the changes to the grande worker and crushing grapes/making wine, if you have tons of excess money (beyond the amount for a tiebreaker) or excess wine, you’re not playing the game as optimally as you should. It’s important for us to make changes that work thematically, and there will be thematic ways to convert lira and excess wine to victory points in the expansion pack. We don’t think those changes are needed for the core game, though. … OK, I am being facetious here, but come on, a worker placement game NEEDS action contestation otherwise is it anything more than a multi-player solitaire? I like the change. I think the game is a little too tight, especially with even player counts. Plus, the Grande Worker only works on one space each year. It’s not like there won’t be any competition. There should still be plenty. Exactly, I completely agree. There’s still enough competition for it to be a tight worker placement game. That wouldn’t be the case if you could place workers at any action at any time. (1) If the Grande Worker (whom we call ‘Mondo’) is played first in a slot, Mondo gets the bonus. (2) If the Grande Worker is played second (ie, slot is full with either a normal worker or the opponent’s Grande), Mondo gets the normal action, no bonus. (3) If the Grande Worker is already in the slot, only the other Grande worker can be played. What this does is prevent a player who goes first from locking out the end-turn altogether. If the game comes down to the final placement and the first player gets the only order fill, or the only crush action, there are two ways to keep the end interesting. One is for the other player to have a crush or fill order winter visitor, the other is for Mondo to come in. Mondo also opens up the sell grapes VP option in summer, and, I’ve found, makes us more likely to build the Tasting Room, Windmill and Cottage, because we can now earn VPs more reliably each turn by giving tours, planting vines, and have more access to the visitor cards. Or maybe we’re just playing the game better. JT–It looks like you’re specifically talking about the two-player game. I think the rules as you stated are the same as the rules I stated above, so I’m trying to understand what the change is. Could you clarify? I can’t get the print-out file to work, but other than that, I really like these changes. As for making one of the meeples a Grande worker, I simply tied a ribbon around their necks to look like a scarf, at least until I can get the actual grande workers from the Viticulture Expansion Kickstarter. It works fairly well! Having playtested the proposed changes, I heartily agree with the direction they have been taken. With regards to the non-blocking rule – I quite like it the way it works now. And, while I don’t find it too difficult to understand, it won’t really be an inconvenience for new players as long as a single person in the table understands it – it doesn’t really affect the actions they can take. I find it adds interesting layers to the game, making the second and third placements of a season more meaningful. So I’m against changing it, although I can see how it might be a little confusing. Perhaps a new, clearer wording is in order? Some of the bonus spaces allow you to take an action more times than you are normally able to, usually twice. This includes the Play a Visitor / Plant a Vine bonus spaces (which allow you to play 2 cards instead of just one), the Harvest a Field bonus space (which allows you to harvest two fields instead of one), and the Crush Grapes bonus space (which allows you to make 3 wine tokens instead of 2). For these actions, you are not allowed to take the bonus space just to block other players if you don’t intend to take advantage from the bonus. In other words, if both a regular space and the bonus space are available, you can’t play your worker in the bonus space if you would get the same result from placing it in a regular space – you have to “be nice” to your opponents, take the regular space and leave the bonus space open. For example, if you only want (or are able) to play a single visitor card, you can’t take the bonus space (which would allow you to play two) unless it’s the only space available, so that other players after you still get the chance to use it to play two cards. Finally, another suggestion for people without Grande Workers – Give each player a coin or any other kind of token. When placing a worker, the player has the option of placing the coin along with the worker (perhaps under it) to signal that it is a Grande. At end of year, each player takes his/her coin back. Super excited for the next Kickstarter campaign! Random question, which I’m fairly sure I have the answer to…..any chance the second edition will have any of the first edition kickstarter bonuses? Even like a bonus pledge level reduced to say 25(If you HAD EXACTLY 25 copies of the original kickstarter left, that is). ? Darren–As long as it’s on Kickstarter, I’m open to including Kickstarter-exclusive bonuses. I don’t have any original copies left, though (the full Kickstarter game, at least). We’d have to print more. Are there certain bonuses you’d like to see again? I’m excited to try out the new changes to the base game. I’m a little bit leery about allowing the Grande worker to take fully occupied actions though, as I thoroughly enjoyed trying to plan my turns in such a tight environment; however, I understand that the game may be more fun this way for the less serious gamers. I have a question about the Crusher cards though… do they have to operate within the 2 wine token limit or can they crush any number of wine tokens? You said they can crush any number of grape tokens, so I assume they are not restricted to a number of wine tokens, but just wanted to be clear. With respect to the ‘be nice’ rule, I think I’d be in favor of eliminating it as you suggest. As you state, it is awkward, and the subject of a lot of the questions asked on this and the BGG site. Also, with the Grande worker officially implemented into the game, people can still gain the bonus if they need it. I think the Grande worker having the ability to use a fully occupied action makes the game a little less interactive and a little more solitaire-ish, so maybe taking away the no-blocking rule will help tip the scales back a bit to the more competitive side. They could be extremely complimentary rules. Players would now have to choose more often between taking a bonus, or being able to take a fully occupied space each year. In my expansion submission I was actually going to present an alternate approach to the Grande worker’s ability which would’ve been to allow players to build a structure ( a toolshed for example) that would then allow them to use a fully occupied space one time. But I guess that would not be relevant anymore. Gordon–The new grande worker ability does loosen up the game a little bit, but we’ve found it maintained the puzzle feel of the game while reducing frustration and increasing the fun factor. Crusher cards have no limit as to the number of wine tokens they can make. I appreciate your thoughts on the “be nice” rule. I think that makes sense. Hopefully a few others will chime in with their input. I still need to try Viti without the be nice rule. I think the toolshed could still work if it was something you had to build, especially since you only have one grande. Can you use the grande worker on an action you have already taken? So in your two player example, one player gives a tour and wants additional lira, so plays their grande worker to give a 2nd tour. Carolyn–Yes, it doesn’t matter whose workers occupy the action spaces when you use the grande worker to take an action that is already full. Thanks! Jamey – I played Viticulture several times with my friends last month, and we found that the Windmill is too expensive for what it achieves. A couple players even made sure to buy the Windmill by the second or third turn to maximize the ability to gain VP’s – all to no avail. Our thought is that it needs to come down in price by one. I’m new to your website, so I haven’t read any of the previous discussion. Have others expressed a belief that Windmill is not a viable strategy as it is currently priced? Hi Michael, thanks for your comment. The pricing of the windmill went through a lot of testing, and I haven’t heard that feedback from anyone else. A game usually lasts 6-8 years, so if you get the windmill on turn 2 or 3, that’s good for between 3 and 5 victory points, which was our target. I’m curious if others have similar thoughts to yours. That’s an interesting point. I should say that the Windmill seems to be seldom used. Perhaps a Windmill opening (possible with the grande worker and the 4 wakeup space, or with the summer visitors which build at a discount) is particularly strong, but I would rather open with Cottage given the chance. And towards mid-game, investing in Windmill seems like diminishing returns. I guess that part of the problem is that Windmill tends to be difficult to use if you don’t build it at the start, since planting vines is not something you usually do towards the end of the game. And planting vines is not straightforward – you need to have the vine card, have room to plant it, have the relevant improvements, and spend two actions (one to get the vine card and other to plant it), leaving yourself open to blocking. If you are near the end, you basically need a Yoke to be able to uproot and replant a vine, since otherwise most vines won’t fit in planted fields. As an additional factor, if you spend the first few actions setting up the Windmill engine you’ll want to plant vines as soon as you can – which means using the 2x plant vine option if available, going against the Windmill. Tasting Room is expensive (and I’m convinced that the price is right – it’d be too powerful if it was cheaper), but getting the bonus takes a single action which you can always take – and which gives money (which is usually nice). I’ve never tried to focus a strategy solely around the windmill… generally a building strategy will include both the Tasting Room and the Windmill and a lot of grape selling. I have however, used the Windmill on various occasions late in the game just to get a point or two to squeak myself to 20 points a turn earlier than I might have otherwise. I already have the vines in my hand, and few people utilize the Planting action late in the game, so its almost sure bet to get 1 vp a turn with a spare worker. Jamey – let me start over- we played about 8-10 games of 3-6 players, and we LOVED Viticulture! Well, most of us anyway (a few non-boardgamers in the group). However, the pattern we noticed is that: 1) a cottage is practically mandatory (all winners had one except the first game); and 2) the windmill is basically superfluous (no one who won ever had one). We even had a fairly long conversation at the end discussing the strengths and weaknesses of the game. We all agreed that the tasting room is priced right, but for exactly the reasons Andvaranaut pointed out, windmill is overpriced. Planting is not straightforward like giving a tour is. This isn’t to say that Windmill is never useful – I think Gordon’s experience is similar to mine. But to the extent that the goal of Viticulture is to provide multiple strategies that are comparably capable of winning the game, the WIndmill seems too underpowered, in contrast to the Cottage, which is practically mandatory (at least from our experience), which is problematic in its own right. Gordon, Michael, andvaranaut–Thanks for your feedback on the windmill! Two quick things to consider: With the new grande worker rule, it’s almost always possible to build the windmill the first year if you want to. You can use a worker to get money and then use the grande to build the windmill. That leaves the potential for quite a few VPs over the course of the game if your strategy benefits from planting lots of vines. Also, even though it’s easier to give tours, having a ton of money doesn’t do you much good in the end game (except to serve as a tiebreaker). So I think that helps balance the windmill and tasting room a bit. I agree that having the Grande worker might make the Windmill a bit more attractive, but I’m not sure how helpful it is to build the Windmill on the first turn, since it is impossible to build a windmill and plant a vine on the first turn. Instead, I see the advantage of the Grande worker as ensuring a player can plant a vine (assuming they have a plantable vine) every round of the game, without regard to whether all the ‘plant vine’ spaces are filled. Our games tended to be over in 6-8 turns, so if a Windmill is almost assuredly going to resuilt in a VP every year, irrespective of the ‘plant vine’ spaces being fully occupied (especially in the years 2-4, when most planting occurs), then yes, it becomes more attractive. Hi guys, just want to say well done on getting your game published, the artwork is super and the theme is original. I have played mostly 3 player games, and a handful of 4 player games of Viticulture. The new rules you have suggested I hope will aid in the games playability. I have the retail version, and in the games I have played, I have won every time without needing to fill wine orders. My game plan is to buy the tasting room and the cottage and simply gain my points from the visitor cards and giving a tour. Taking this path tends to make the other players frustrated as it is meant to be a game about producing wine. The new rules about the Grande Worker I feel will limit my ability to win with this strategy, due to the blocking/limited spaces available each turn to make wine and complete an order. This is a good thing, the visitor cards at times seem a bit to powerful, and I was considering playing with a rule that it cost money or a VP to play them. Jimmy–Hi, thanks for your feedback. I’m a little surprised that your friends have allowed you to get away with not filling wine orders every game. :) It’s very, very difficult to do that if the other players are efficient and are paying attention to what you’re doing, especially since you can only get 1 VP a year from the tasting room. It’s good that you’re taking full use of the visitor cards, though. A number of the stronger ones require wine production in some capacity–have you been able to avoid making wine altogether? Hi Jamey, I usually wine by getting the 1 vp on the initiative track, then 2 vp from giving a tour. As for the visitor cards, I have been lucky in getting the “Broker, Wedding Party, Auctioneer and the Horticulturist quite a lot. True the others should be trying to stop me doing this, but I am able to block people from filling their wine orders, by going to the spots I can see they need to go. Keep in mind that you can only get a max of 1 VP/year per tour. So if you take the tour twice in a year, you only score 1 VP (assuming, of course, that you’ve already built the Tasting Room). Correct, I aim to get the 2vp from the tour and the 1vp from the order track, if the 1vp has been taken then I usually get a summer card. 3vp per summer season is a good run seeing that you only need 20 to end the game. Combined with the points from the visitor cards, it makes for an easy path to victory, and I aim to block other players from being able to produce their wine, which is mean but it is a strategy. This will be harder to achieve with the amended rules that Jamey has come up with. Jimmy–I’m a little confused how you’re getting 2 VP from the tour. The tasting room says that you can get a maximum of 1 VP from it a year. @anyone – I know this sounds ridiculous, but how do you rate a game on BoardGameGeek? My luddite tendencies are preventing me from figuring it out. I’ve not had a problem with the middle space rule at any point. It’s just a case of “Oh, can you do that bonus? No? Just move it to the left a bit and it’s all good”. I think it adds spite to the game where none is needed. Thanks Patrick! That was definitely the original intent. Interesting. Thanks for sharing your perspective. Perhaps it matters less with the grande worker anyway. BTW, I did this testing with and without the grande work as well. It definitely matters less with the grande worker available. In regards to the Grande Worker – I wonder how people would feel if you didn’t start off with one, but you could ‘upgrade’ one (and only one) worker by sending them to the school. You would then have a choice of getting a new worker or upgrading the worker that goes there. This will put an interesting decision (due to a conflict of interests) in the player’s hands. Since the main intent of the Grande worker is to alleviate the end-game problem, this helps facilitate that, without loosening the restrictions too much. People who have Grande workers will be less concerned with waking up early (especially at the end), but other players may still want to, leading to multiple strategies. Val–We tried that, but we found that one of the most frustrating logjams actually happen at the beginning of the game when players want to have more options open to them. When do you think the second edition will be Kickstarted? We’re aiming for February, but we have a long way to go before then. At the latest, I want to deliver the game by Christmas 2014, so that would mean a Kickstarter in May at the latest. I’m late to the Kickstarter world and only recently found out about Viticulture and the upcoming Tuscany expansion. I’ve signed up for the mailing list and am looking forward to supporting the 2nd edition and the expansion. I.e. I’m in! It’s never too late, Doug! Well, it’s kind of too late. :) But there will be more Viticulture soon with Tuscany! Thanks for signing up for the e-newsletter. Another cool idea would be including El Grande workers in the kickstarter too for us folks with version 1. make it a stretch goal? Great game, Viticulture I’ll be playing tomorrow with my family on Christmas day!! Looking forward to February..
Jeff–Thanks for your ideas! We were planning something similar to our sticker idea, but with a tile you’d place on the board. Also, all versions of Tuscany will include the grande workers. :) Merry Christmas! Jamey- Thanks for the response. One other minor suggestion. Could you reprint the text on the Crusher/Crush Expert to support the rule change? Something like ‘Crush any or all of your grapes into wine’? It’s a minor point, but the issue with the current text ‘any or all types of wine’ My group was reading into the card that ‘any type of wine’ meant that the crusher had some magical power to make white white from red grapes. I do want to make sure the text is as clear as possible for the rule change, though (despite the original meaning of the Crusher not changing). I’ll take a look at it. Whatever happens please bring more copies of Viticulture to the United Kingdom! We will! :) Many more. Still patiently waiting for the new Kickstarter here …. well perhaps not so patient as I was in November. Let’s say waiting with growing anticipation. Hi, thanks for the rules updates. As a general rule, will you also include the quick reference sheets without a background image. On files I have to print myself, they are much easier to read without the beautiful background images. I usually open them up in Illustrator and remove the backgrounds myself, but then I lose your font selections. Thank you for changing the “crush grapes” part. This led to more than a few debates in our group. Specifically cards that allowed you to crush grapes into any/all types. Most people assumed that meant a free-for-all on wine-making. Glad to see this clarification. I just want to clarify that the updated components/cards will be mailed to me along with a copy of Tuscany, as I will be able to indicate so once the KS is done, correct? However, I have a friend who is not sure if she will be buying Tuscany yet. Can she somehow still receive the updated components/cards for free for her first edition of Viticulture? How Can I Get the Update Pack? 1. Back Tuscany on Kickstarter and let us know that you are a current Viticulture owner on the post-project survey. If you do this, we will include the Viticulture update pack for free inside the Tuscany box. It costs us money to make, but we’re able to offer it for free to you because we don’t have to ship it separately. 2. Purchase the update pack by itself from our website in August. The price will be around $10, perhaps a little more depending on where we’re shipping them. If you’d like to choose this option, I would highly recommend you subscribe to our e-newsletter (which you probably already receive unless you unsubscribed to it). I have only recently stumbled across Viticulture on BGG last month, and loved the concept so much I ordered the game (unknowing that it was only the 1st edition). After more research on the web, I found the Kickstarter project for Tuscany and signed up for my pledge to get the 2nd edition update to Viticulture along with the Tuscany expansion. As of this date most of the stretch goals are met including the Soldato (solo play). After reading thru the rules of solo play, the “bonus activity token” rule caught my attention. This is the rule that puts a one time use glass token next to each of the 7 wakeup chart spots. When you choose a turn order spot on the wakeup chart with a token next to it, you get to accumulate the token to use on a bonus space on one of the summer/winter action spaces and take the bonus action along with a placed worker on a regular action space. Playing the 2 player game can be frustrating since you are locked out of the bonus spaces from the middle action spaces. Since the Soldato play is technically a 2 player game of you and a virtual player, I added the “bonus action token” rule into the two person player game. Using the same rule but available to each player, the one time use glass token next to the wake up chart can be picked up by a player who chooses the spot on the wakeup chart that has a glass token there. This allows the bonus spaces to be available when one has the bonus token, and it also encourages the players to use all the wakeup chart spots instead of just the most powerful ones (usually the 1 victory point or the extra worker) every year. Correctio, I menat to say Automa play for solo play, not Soldato. I like that idea Larry. It feels like the bonus action is always taunting you in 2 player games without being able to take it. And I liked the original Grande worker rule for 2 players where you can take the bonus. But perhaps it made the Grande worker too powerful, and that’s why it was dialed down a notch. It is getting closer to the date that Tuscany will be shipping and as stated on the KS page “These updated components are standard in every second-edition copy of Viticulture, and we will provide them for free in the Tuscany box for any current Viticulture owners”. I do not recall seeing any list of what components will be included to the Tuscany backers. I am pretty sure you have confirmed there will be the updated visitor cards and a Grande worker for each color. I would like to know if the new components include a new game board with the “Crush Grapes” winter action reprinted as “Make up to 2 wine tokens”, and the new player mats with the table on what wines can be made with what grapes”? Or will there be just be a sticker to tape on the old boards available? Larry: The free inclusion of the second-edition updates are included in Tuscany for Kickstarter backers, not for everyone. The list of second-edition components included for free are at the top of the Tuscany project page in the “add-ons” graphic. OK I see it now, I thougt i saw the list before but could not remember where. Thanks, and I am a backer of Tuscany so I am anticipating the new updates with the Expansion. I backed the project at the Complete Collectors Edition, so plan to give my 1st edition with the updates to a gamer friend and keep the shiny new Viticulture 2nd edition for myself. Can you explain the difference between the collectors edition which includes Tuscany, or just purchasing both viticulture 2nd edition and Tuscany separately? Seth: The Collector’s Edition has Viticulture and Tuscany (exactly as they would be if you purchased them separately), plus 72 custom metal lira coins (which you can also get separately through our website), plus a wine-crate slipcase (which is not available). can you tell me when Viticulture 2.0 (without Tuscany) comes approximately onto the market in Germany? Phil: Thanks for your question. Viticulture 2.0 released to retailers worldwide back in September. Any German retailer should be able to order it. If your local store has any difficulty ordering it from their distributor, please have them contact me and I’ll figure out what’s going on. So please clarify this for me… in the 2P game, can the Grande worker get the bonus or not? 1. When you place any worker on an action when there are more than one action spaces available (i.e., in a 3-6 player game), you can place the workd on ANY of the available action spaces. The first action space doesn’t have to be the one with the bonus on it. 2. When you place a grande worker on an action with available action spaces, he acts like any other worker. He only gains the bonus in that case if he’s on an action space with a bonus. 3. If there is an action that has no available action spaces, you may still place your grande worker on that action (not on an action space). If you do, he takes the action (no bonus). I am specifically talking about the 2 player game only. In a 2 player game, there is only 1 action space available, right? So there is no way to get a bonus in the 2 player game, because you only use the left-most action circle, which has no bonus, correct? Right, there’s only one action space available in the 2-player game. There are no ways to get the bonuses on the Viticulture board (Tuscany opens up some options for this with special workers and the extended board). Let’s say I have 1st Ed Viticulture, with the Update Pack, does it then make it 2nd ed? If no, what would I be missing? Thanks! Aaron: Indeed it does! That will equate to a second-edition copy. The one thing you’ll need to do is download the second-edition rules (you’ve seen the pages on this page, but the second edition rules overall are clearer than the first edition). Hi Jamey, thanks for the reply! 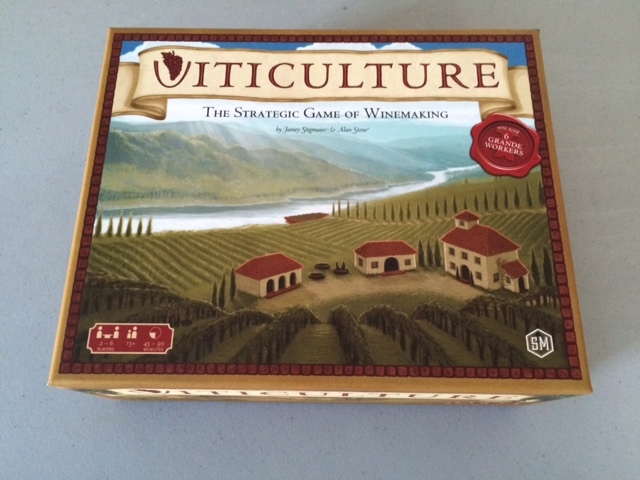 So does the second edition rulebook come with the second edition copy of Viticulture? Aaron: Sure, the second edition of Viticulture includes a second-edition rulebook. But the update pack by itself does not include a rulebook. I bought Viticulture 1st edition and Tuscany from two different boardgame dealer in Germany, promoted by BGG market place. In the box of Tuscany are several updates for Viticulture and the Viticulture box contents also some update material. Now I’m only missing the updated visitor cards. How can I get them avoiding to buy several items a second time (like the expansion arboriculture, which I possess twice now). Volker: Did the version of Tuscany you bought have the update pack (if it’s not STM302, it doesn’t have the update pack)? If not, you can just buy the update pack on Amazon.de–it has everything you need. So it’s all right to order from your website. Hey there, is it possible to just order the wine crate sleeve from here? Sorry Aaron, but we did a very limited print run of the wine crate sleeve–we don’t have any left. Thanks! I updated the link.